Dr. Abe Kauvar used to joke he was never tired. How could he retire? 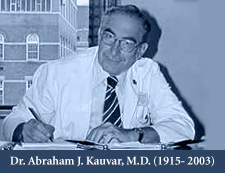 The collection highlights the career of Dr. Kauvar. The collection includes correspondence, newspaper clippings, awards, memorabilia, and photographs. The papers document the professional and personal life of a major figure in Denver's medical community. The collection also contains correspondence with Rabbi Charles E. H. Kauvar (Dr. Kauvar's father), who was a noted religious leader in Denver.